Mitsubishi’s new range of cross-flow laser cutters has arrived in the country via recently appointed Australian distributor Applied Machinery. Mitsubishi claims its cross-flow laser cutters can produce high quality metal cutting work while keeping gas consumption and CO2 emissions to an absolute minimum. Mitsubishi claims its cross-flow resonator design is state-of-the-art technology in laser cutting machines, offering a range of outstanding features and benefits, not least substantial savings on both running and maintenance costs. Firstly, the cross-flow low velocity design leads to a decrease in the energy required to excite the laser gas, resulting in less gas consumption and lower power usage. Secondly, no turbine is required; and finally, the larger cavity size results in more gas being available at any one time, therefore less gas is required to be blown throughout the system by the fans. Additionally, power consumption during standby is drastically reduced along with reduction of electricity consumption provided by just-on-time discharge. As a result of this technology, an extremely efficient 3 litres per hour (L/h) laser gas usage is achievable, along with a staggering 90 per cent saving of energy in standby mode. Operators can also expect a 30 per cent reduction in carbon dioxide emissions compared with a traditional laser with axial flow resonator, thereby assisting companies endeavouring to reduce their overall carbon footprint, the company says. Also, with no glassware and a greatly reduced number of o-rings, maintenance is further reduced leading to more up-time and greater productivity. Other benefits of the cross-flow technology include an increased stability of beam mode due to the slow gas flow. The machines also provide unprecedented accuracy with thin, medium and thick work pieces in a wide range of materials — particularly noticeable, for example, in the roundness of corners, eliminating the need for any post processing. In particular, Mitsubishi Electric’s ‘Brilliantcut’ technology has astounded many sheet metal processors by delivering surface finishes and quality previously only associated with grinding processes. "While these remarkable machines can cut practically all metals, we must also remember they have a wide range of applications in other areas including plastics and composite material processing," Applied Machinery Sales Director John Goodrich says. Applied Machinery expects the majority of sales to come from small and large laser cutting companies, along with general sheet metal and fabrication businesses looking to expand their capabilities. Additional interest is expected from plastics and composite companies as they begin to understand the value in this technology, and how it can replace existing, less efficient, less versatile means of material processing. An extensive range of eX series machines will be available from 2.7kW through to 6kW laser power, with sheet capacities ranging from 2,400mm x 1,200mm, through to 6,000mm x 3,000mm. 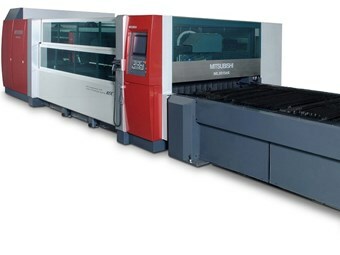 In addition to the models above, Applied Machinery will also offer a premium 2.5kW Mitsubishi Fiber Laser — the ML-3015 NX-F.
"While the Mitsubishi cross-flow resonator laser cutters offer many benefits including a significant reduction in running costs, potential customers will be pleased to learn they are also very competitively priced," Goodrich adds. "Unlike other machinery suppliers, we don’t just sell machinery. We have specialist service engineers who install the equipment and most critically, train our customers and their staff to use it efficiently and safely. Then we provide regular servicing and follow up. That’s Applied thinking." Mitsubishi Electric has been a leading developer and supplier of laser cutting machines to the global sheet metal processing market for more than 30 years. The company enjoys a global market share in excess of 15 per cent, with in excess of 10,000 laser processing systems sold worldwide. Find laser cutters for sale.